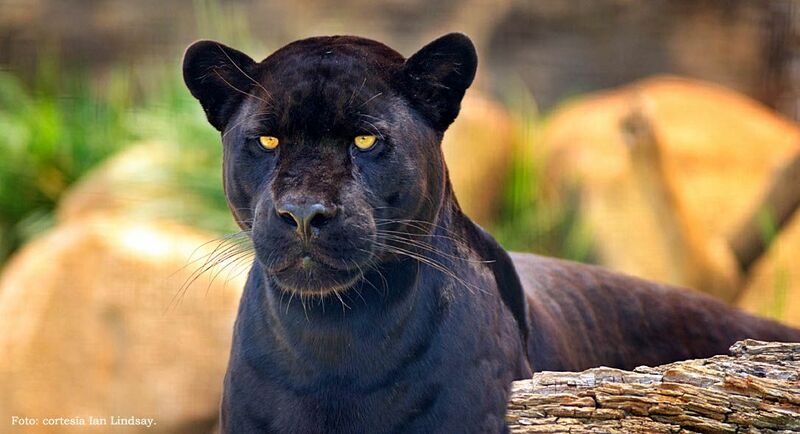 They are also called Black Panthers, but they are the same species. They are of that color because of a greater amount of melanophores (cells belonging to one of the skin layers) distributed throughout the body surface than the most common gold specimens. Depending on the light reflections on them, classic spots (rosettes) can be seen in a darker black, and in some instances they can even be seen with the naked eye, as if they were at an intermediate point between them. Not much information exists on this type of Jaguars. Apparently, more of these individuals are found in jungle areas and not in open places such as savannas and meadows. Finally, in the same litter of puppies there can be gold and black specimens, despite being brothers. This is a common phenomenon in other species of felines (leopards and wildcats, for example). Although there are numerous stories about sightings of melanistic specimens in Misiones province or the Yungas of Salta, as far as we know, there are no documented cases (no photos, no leathers) that allow us to affirm it, although they probably exist.